That’s right, the Impreza and famed WRX — joined at the hip since 1992 — are going their separate ways. While the new production Impreza debuted at this year’s New York Auto Show, the next WRX will take a completely different path of development and will not surface until 2014. We know this because Subaru president Ikuo Mori said at a recent shareholder’s meeting: “We will launch a new sporty car in 2014.” The WRX is that car. In the past week, we have learned from a source just how different the new WRX will be to the Impreza, employing totally different components. This image, revealing how one artist sees the new WRX, depicts a new coupe model with a shorter wheelbase and heavy-duty bodywork It’s important to note that this is just one vision of the new car, it may turn out to look much different. Our source also tells us Subaru bosses haven’t decided if the WRX name will survive. For the time being, we’ll refer to it as WRX. “Apart from a few nuts and bolts, every part on the WRX will be unique. Even the engine and body. Obviously the WRX’s platform will be inherited from the new Impreza, but it will be radically modified and significantly shortened,” says our source. From now on, the Impreza will be the company’s core model, boasting a fuel-efficient, naturally aspirated 2.0-liter boxer engine. The car’s wheelbase has been slightly lengthened, while the A-pillar has been brought forward to maximize interior space and comfort levels. At this point, it is unclear if Subaru will attempt an Impreza-based performance model to bridge the gap until the new WRX arrives, but it appears unlikely. “Up until now, the Impreza and WRX used many common parts, which translated into entry-level Imprezas that were over-engineered,” the source continued. The basic chassis and suspension had to employ certain parts needed for the WRX. That drove costs up, and many entry-level customers did not want or understand the significance of such high-tech parts, stresses our insider. The WRX, on the other hand, will employ the very best from Subaru’s parts bin, starting with an updated version of the company’s rally-proven AWD system and a turbocharged boxer engine. “The first thing you must understand about our all-new WRX is that we have developed it from the ground up to win in motorsports events. That’s why we have focused so heavily on weight issues, not to mention a shorter wheelbase that permits faster, more precise turn-in. Marry that to our proven AWD system, and we think we have a winner,” explains our source. “Obviously the rally model will be based on the top-of-the-line STI car, but unlike previous Impreza WRXs, this new WRX will be more hard-core and less forgiving on bumpy road surfaces,” adds our source. Collaboration with Toyota on the FT-86 project also seems to have something to do with the direction of the new WRX and STI. “If the truth be known, we were able to focus so deeply on the motorsports element with the new WRX because we developed a sister car with the Toyota FT-86. Bosses gave us permission to go all out because that car exists,” says our insider. Our source also revealed what is going on in the bowels of Subaru’s R&D. On the short list for the WRX’s powerplant is a turbocharged 1.6-liter boxer pumping as much as 270 hp, and a twin-charger system involving a supercharger is being tested as well. The car’s body is rumored to be a little bigger than a Toyota Yaris, while its tread width is said to expand significantly. As for the STI, we are told that the flagship will also employ the WRX’s 1.6-liter boxer turbo, but that the engine will be reworked to generate upwards of 300 hp for motorsport competitiveness. Subaru bosses see the new WRX initially competing in domestic rallies and gymkhanas, but they are also targeting Europe’s World Touring Car Championships as well as the long-awaited return to the WRC. Bottom line? Get used to saying Subaru WRX (most of us enthusiasts do, anyway). Expect unprecedented levels of AWD handling and performance at a bargain price — the vehicle should land in showrooms in roughly two years in the $26,000-$29,000 range. -Higgins surpasses time set by Travis Pastrana last year. CHERRY HILL, N.J., June 27, 2011 /PRNewswire/ — Subaru of America, Inc. Subaru Rally Team USA driver David Higgins broke the long standing Mt. Washington “Climb To The Clouds” Hill Climb record set in 1998. 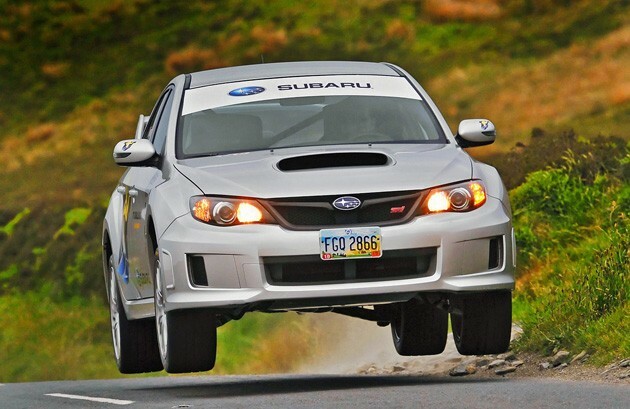 Piloting his 2011 Subaru WRX STI rally car, Higgins crushed the time set by Frank Sprongl by more than 30-seconds with an official time of 6 minutes and 11.54 seconds. Higgins also beat the unofficial record time set by Travis Pastranalast year of 6:20.47. True to its reputation, the mountain yielded poor weather throughout the practice days on Friday and Saturday. The field of almost 70 competitors, in the four race classes, was kept to the lower half of the course because of intermittent rain showers and fog. The weather cooperated long enough on Sunday for competitors to get in two timed laps before the course was again engulfed in fog. Higgins was the last to race in the field of the competitors, which built up anticipation of a new record amongst the fans and enthusiasts in attendance. On his first attempt Higgins was able to surpass the record by more than 20 seconds. Higgins bested his record by an additional eight seconds on his second attempt, cementing his place in the record books. Mt. Washington is located in the Presidential range of the White Mountains in New Hampshire, known for its extreme conditions, scientists have been researching and studying weather trends since the 1870’s. The carriage road, now the Mount Washington Auto Road, was erected in 1861 and is the country’s oldest man-made attraction. Spanning a distance of 7.6 miles, the mixed gravel and pavement road winds its way up the mountain lined with trees and at times steep drop-offs. First run in 1904, the race to the 6,288 ft. summit of the Northeast’s tallest peak is one of the greatest motorsports challenges for both man and machine. Subaru Rally Team USA heads to Maine for the New England Rally, July 15th and 16th. Higgins, the points leader for the Rally America Champion looks to clinch the title of which he has dominated for the past 3 rallies. The team will then head to Summer X Games 17 at the end of July to compete in the Global Rallycross finals. Subaru of America proudly sponsors the on-going scientific research of the Mt. Washington Observatory. As the “official car” of Mt. Washington Observatory, Subaru sponsors programs, like the “Subaru Science In The Mountains” series that educate consumers. For the adventurous, Subaru also sponsors the annual “Seek-The-Peak” mountain climb. The annual Isle of Man TT plays out on a 37.8-mile course made up of public roads, which are closed down during race days. It’s run by motorcyclists, and crazy sonsofbitches skilled pilots can complete the loop in under 18 minutes. Curious how long it would take an automobile to run the same course? Back in 1990, driver Tony Pond was curious as well, and he pushed a Rover 827 Vitesse around the island in 21 minutes, becoming the first driver to average 100 miles per hour in a car on the course. Subaru decided to have a go at that record, and sent a WRX STI sedan and driver Mark Higgins to the Isle of Man. The car is a stock STI, with the exception of a roll-cage, race harness, fire extinguisher and adjusted springs and dampers to handle the various bumps found on the public roadway. How’d Higgins do? He smashed Pond’s record by two minutes, with a time of 19:56.7 and an average speed of 113 miles per hour. Higgins stated, “Setting the record was both the most exhilarating and the most frightening thing I have ever done.” We believe you, and we salute you Mr. Higgins, on a rather impressive bit of driving. Subaru Rally Team USA driver David Higgins and co-driver Craig Drew have won the Susquehannock Trail Performance Rally (STPR), round five of the 2011 Rally America National Championship, by a mere 1.3 seconds over rival Antoine L’Estage. Higgins and L’Estage battled back and forth throughout the event with Higgins staging a late rally comeback that saw him take the rally lead on the penultimate stage after overcoming a thirty-seven second deficit midway through the final day of action. The amazingly close finish came after over 120 stage miles spanning two days of competition on high-speed forest roads of north-central Pennsylvania. The win at STPR is Higgins’ third victory in a row in the series and extends his points lead in the Rally America National Championship standings heading into the sixth and final round next month, the New England Forest Rally. Higgins’ Subaru teammate Dave Mirra with co-driver Marshall Clarke finished 5th overall after staging his own comeback by working his way up the leaderboard from a 12th overall position after giving up nearly eleven minutes due to a pivotal pace notes error. Mirra’s Subaru STI sustained damage from the resulting accident but remained mechanically sound, and Mirra was able to continue and impressively work his way up the field for a valuable points finish. The battle between Higgins, a winner at STPR in 2002 and 2003, and Antoine L’Estage, the defending Rally America Champion and 2010 STPR winner, was exceptional. L’Estage struck first and grabbed a 14 second lead after a short first day of competition. Higgins then battled back early on day-two and took a slight lead before dropping time when his in-car intercom with co-driver Craig Drew failed while on-stage forcing Higgins to slow down while they used an improvised hand signal system. Higgins was then hampered by a tire puncture in-stage that slowed him further, leaving him thirty-seven seconds adrift of L’Estage with just four forest stages and one short Super Special Stage remaining. Higgins then pushed his Subaru STI to the limit and began to catch L’Estage on the final loop of stages. In a nail biting comeback Higgins eventually overtook L’Estage on the penultimate stage and took a 2.5 second lead into the final Super Special Stage where he held off L’Estage’s final charge to win by a mere 1.3 seconds. “It was a fantastic battle with Antoine and (co-driver) Nathalie (Richard). It’s always great to win a close fight so think I will remember this for some time,” said Higgins at the podium celebration. All of STPR’s competition stages were won by either Higgins or L’Estage, with Higgins fastest on seven stages and L’Estage six. STPR is round five of the six-round Rally America Championship and is based in Wellsboro, PA. STPR features some of the fastest roads in the series with many technical sections with trees closely lining the roads. Severe dust caused visibility issues until approximately midway on day-two, when heavy rains in the area challenged teams with slippery roads.